Andrew Piper grew up liking books and loving computers. While occasionally burying his nose in books, he was going to computer camp, programming his Radio Shack TRS-80, and playing Pong. His eventual love of reading made him a historian of the book and a connoisseur of print, but as a card-carrying member of the first digital generation—and the father of two digital natives—he understands that we live in electronic times. 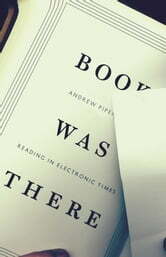 Book Was There is Piper’s surprising and always entertaining essay on reading in an e-reader world. Much ink has been spilled lamenting or championing the decline of printed books, but Piper shows that the rich history of reading itself offers unexpected clues to what lies in store for books, print or digital. From medieval manuscript books to today’s playable media and interactive urban fictions, Piper explores the manifold ways that physical media have shaped how we read, while also observing his own children as they face the struggles and triumphs of learning to read. In doing so, he uncovers the intimate connections we develop with our reading materials—how we hold them, look at them, share them, play with them, and even where we read them—and shows how reading is interwoven with our experiences in life. Piper reveals that reading’s many identities, past and present, on page and on screen, are the key to helping us understand the kind of reading we care about and how new technologies will—and will not—change old habits. Contending that our experience of reading belies naive generalizations about the future of books, Book Was There is an elegantly argued and thoroughly up-to-date tribute to the endurance of books in our ever-evolving digital world. Do You Have the Know-How to Self-Publish?